Experienced guitar teacher Dyce Kimura offers complimentary Fort Lauderdale guitar lessons to those who are currently students, or to those who have taken lessons from him in the past if they refer a friend for lessons. For a short time only, Fort Lauderdale guitar teacher Dyce Kimura is offering his current and past students a special deal on guitar lessons. If they recommend a friend for a lesson and that friend comes for at least one lesson, Kimura will give the referring student a complimentary lesson. Starting lessons with a new music teacher can be intimidating. However, if the student knows someone who has received instruction from that teacher and who has had a positive experience, the whole process is made easier for teacher and student. Miami guitar teacher Dyce Kimura recognizes the challenge of starting new lessons, and he wants word to get out through his students that he is currently accepting more pupils. He also wants to show his appreciation for the students he teaches now and has taught in the past by giving them a complimentary lesson for their help. 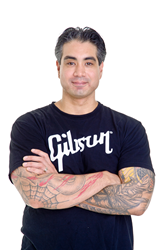 Dyce Kimura offers Fort Lauderdale guitar lessons in both acoustic and electric guitar. Understanding the limitations on his students' schedules, Kimura offers in-person lessons, but also offers his services as a Skype guitar teacher. Some students cannot meet in person, and he is more than willing to teach a lesson through webcam if this suits his students better. This is just one example of Kimura's flexibility in teaching style. Students can also purchase his 10-video beginner guitar lesson set to get themselves started on guitar. Whether a student is a beginner or an advanced musician, Kimura is an excellent teacher. His patience is endless, and his ability to draw the best out of his pupils is evident. Being an exceptional musician himself, Kimura is an inspiration to all his pupils as they hone their guitar skills. Whether a student wants to advance his or her current musical abilities, transition from acoustic to electric guitar, or simply learn how to strum, Kimura is ready to help that student accomplish his or her goals with his thoughtful, encouraging teaching style. “My goal is to share my passion for music with anyone who has a desire to learn guitar,” says Kimura. Dyce Kimura has been an accomplished guitarist for almost 30 years. Teaching a wide variety of ages, Kimura's lessons are in high demand in the Fort Lauderdale area. When he is not teaching guitar lessons, Kimura can be found playing his guitar at local music festivals and venues, as well as leading worship at Lighthouse Community Church.